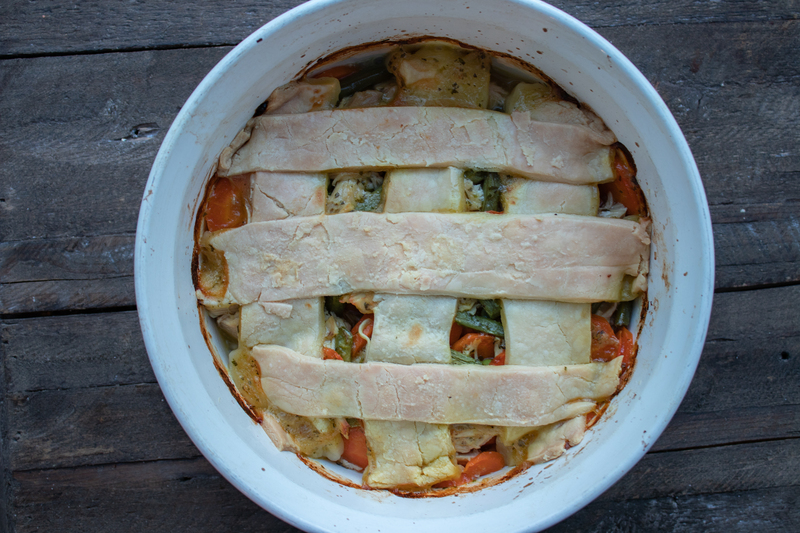 Hey Friends– I thought I would post this low FODMAP chicken pot pie recipe that I whipped up for Russ and I last week. I used a few short cuts–I bought a plain rotisserie chicken (ingredients=chicken only), FODY foods chicken soup base, and Whole Foods Gluten Free bakehouse pie crust. You can prep the filling in advance which makes this recipe a bit more convenient on a busy night. You’ll find the pie crust in the frozen foods section. 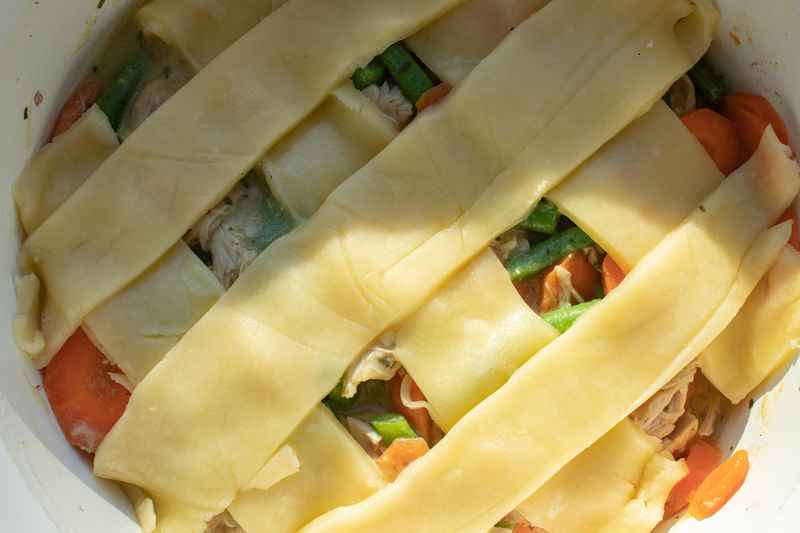 The pie crust is inside a pie shaped tin but I just rolled it out and cut in strips over the tarragon-infused chicken and vegetable filling. This is such a hearty comfort food dish. Russ and I ate almost the whole chicken pot pie! Ha! This will serve 2 hearty servings–or up to 4 people. And disclaimer–the pictures reveal very clearly that I am not a pastry chef. 🙂 But, rather this is real life in the Kate Scarlata kitchen! That being said, the flavor is amazing and I bet you can do a better job making this look like a good looking chicken pot pie! Feel free to share your gorgeous pictures with me on Instagram! In 9 x 9 square or 9 inch diameter round casserole dish, add cut chicken. In medium skillet, add garlic oil and carrots, cooking for about 2 minutes. Add in green beans and peas, cooking for another 1-2 minutes. Add vegetables to casserole dish with chicken. In the same skillet over medium heat, add gluten free flour and butter (or oil), making a roux. Slowly add chicken broth and raise heat to medium high to thicken chicken sauce. Add in milk and tarragon. When sauce becomes gravy-like consistency, remove from heat and add to chicken and vegetable mixture. Chicken pot pie looks delicious! What is a flour blend? To thicken the sauce I just used Trader Joe’s gluten free flour blend–it is a gluten free blend of flours that are suitable on the low FODMAP diet. You can sub in brown rice flour but I tend to have the GF blends in my house. Any way to make this vegetarian instead of the chicken / broth? Any way to make a vegetable pot pie, without chicken/broth? Thanks for everything. This recipe is truly for the meat eater. Sorry!